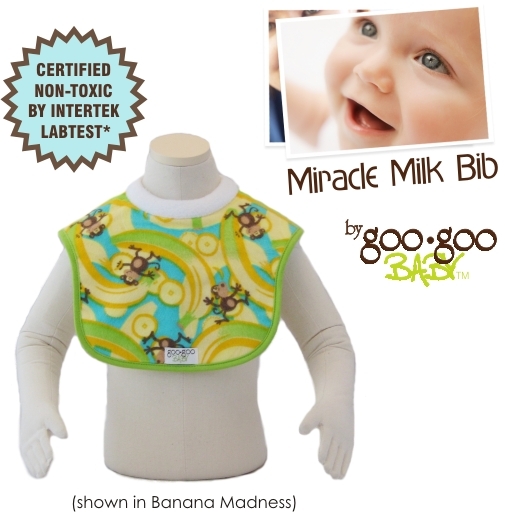 Miracle Milk Bib - Perfect for newborns and infants! Great for babys that spit up or have reflux disorder - Doctor recommended! The Miracle Milk Bib was designed to keep baby dry specifically during bottle and breast feedings. It takes newborn babies time to learn to suckle, often-making feedings a wet and cold experience. With the Miracle Milk Bib, three precise layers of fabric act to pull liquid away from the surface into the absorbent core. The waterproof lining then prevents this liquid from soaking through to your baby’s skin. A soft fleece neck roll stops rashes by preventing fluids from leaking down baby’s neck. We provide adjustable neck fasteners for a comfortable fit without the use of sharp Velcro or rusty metal snaps. Say goodbye to cheap bibs that don’t work and can irritate baby’s delicate skin! The Miracle Milk Bib is easy to clean – just machine wash in warm water and tumble dry. The Miracle Milk Bib is part of our matching Luxury Layette product line, which includes the Reversible Cuddle Blanket, Reversible Burp Pad and Plush Pocket Blanket.